This ox is owned by its sponsor. In tribute to the rich historical heritage of Hopewell Valley, I have designed an ox named George Oxington. 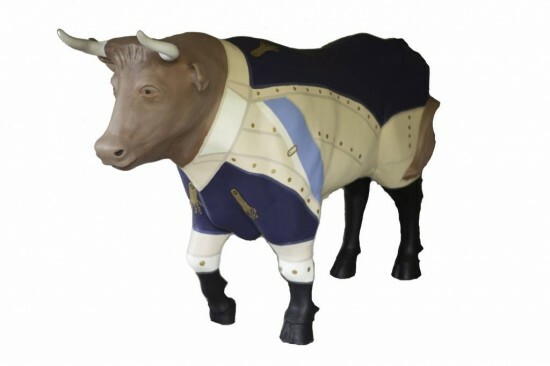 The ox is to commemorate the soldiers and civilians who served our country at its earliest need. We are fortunate enough to live in an historically vibrant area of the country. The crossing of the Delaware, the Battles of Trenton and Princeton (not to mention the rest of the action in New Jersey during the Revolution) were part of a turning point in our nation’s history. George Oxington will be a colorful marker, and reminder, of that time period. His attire reflects how George Washington would have looked when passing through and serving our Nation during the time of the crossing and Battles of Trenton and Princeton: blue sash, golden button and straight cuffs. Having lived in Mercer County my entire life and now currently teaching Middle School history at The Pennington School, I have been able to take advantage of its heritage. I remember as a child going to the reenactment of the Battle of Trenton with my father. I fondly remember the Continental Army pushing the British back towards the Queen Street Bridge. I hope this ox will artistically mark these important events.